Before I start with the actual guide, I'd like to share a short introduction about Aliexpress. Aliexpress is a giant online market from China. It was launched in 2010 and had grown a huge visitors worldwide since then. It's very popular in Russia, Brasil and Baltic countries. For the guide I've purchased one particular item to feature so I can show you the basic process from browsing, ordering, paying, etc. blah, blah... you'll also get to see the actual product which I'll have it attached below. 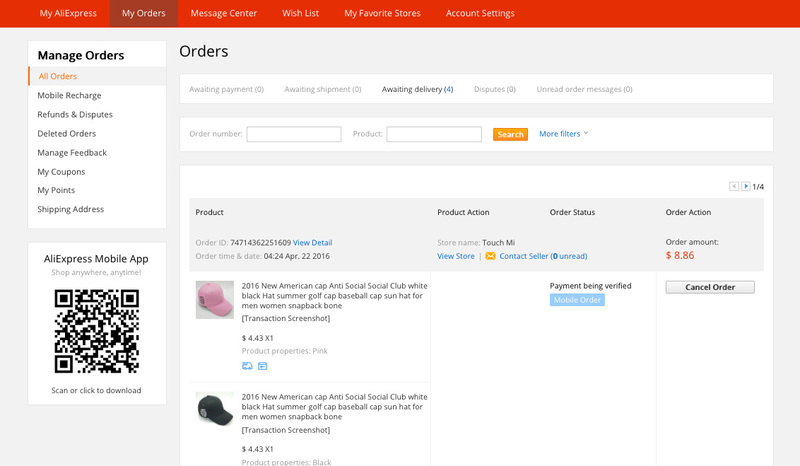 Before anything else create an Aliexpress account (Check out: How to create account here). You can also do this later at checkout, I think. I was looking for something cheap and something I can wear, so I searched for hats. As you can see, they provide a drop down function with a series of similar keywords to help you search and make it easier to find the closest of what you're looking for. Here's a cropped screen grab of the search results. The white Anti Social Social hat on the right most is what I had purchased. After choosing the item you want to buy from the search catalogue, you will be taken to a product preview page with all the details, specifics, more product images and such. In this page you can also add it to your Wishlist. Here's my shopping cart with the pink and black hat. 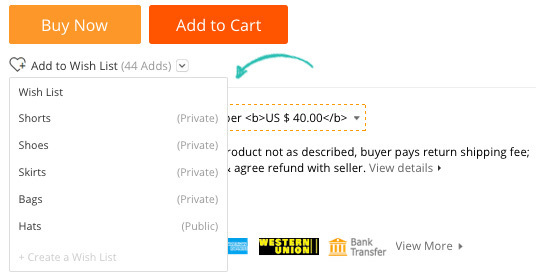 Check your orders and click the 'Buy from this seller' button to proceed to checkout. 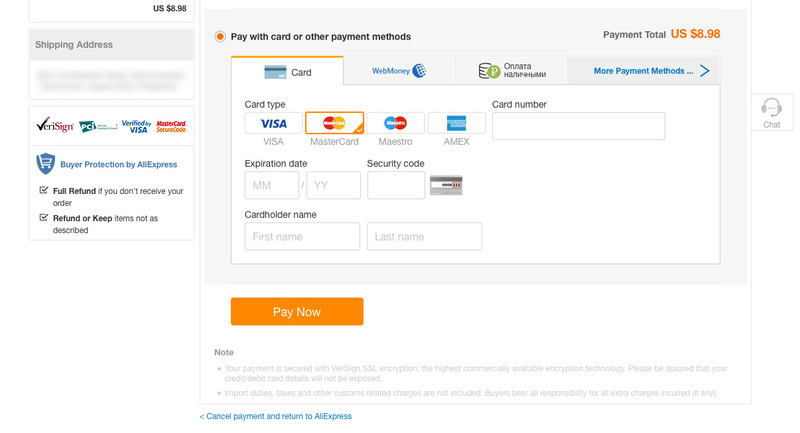 Next, fill out the payment form with your chosen payment method. I pay thru my SmartMoney which is a MasterCard. Click this link for list of payment methods. I actually paid thru mobile.. Because there was a discount for the products I ordered. You can check from the product page if the shop is offering discounts. Below the posted price you'll spot a QR code which you can scan via Aliexpress mobile app to see if there is extra discount when you shop mobile. On my case, there's a 0.12 extra discount, and I will avail that one so I paid via mobile. Hahaha. More about payments, click here. The discount was a pretty small amount.. I saved like 0.12 hahaha, but since I will still be paying for Philpost handling/fee.. that small amount matters to me. Lol. Saving is good thing no matter how small the amount is. Yes! A successful payment notification will be sent to your email address. After payment you may now check your latest (even previous) purchase on 'My Orders'. From here on you will have to wait until the seller has packed and shipped your order. 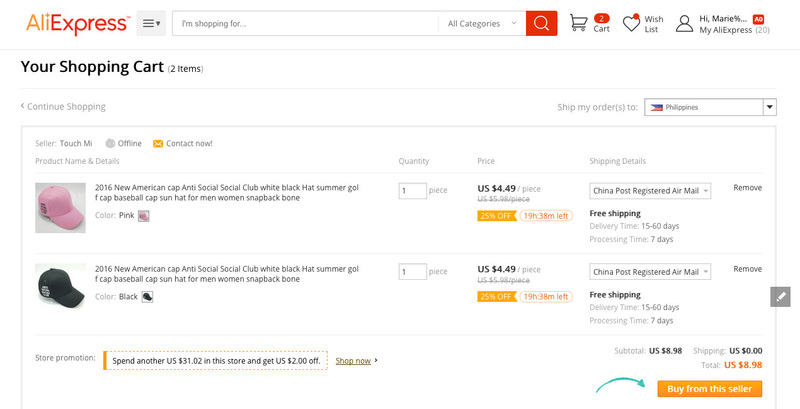 Your transactions will now be saved and you can look back on the items you've ordered on Aliexpress. I'm actually happy with this seller, my order was shipped just a few hours after payment. Usually, other sellers would take 2 or more days to ship the item. By the time the seller had shipped the item you may go back to 'My Orders' menu and track the shipment. You may click the 'Track Order' button to open the tracking page, or just hover like the image below for a quick view. 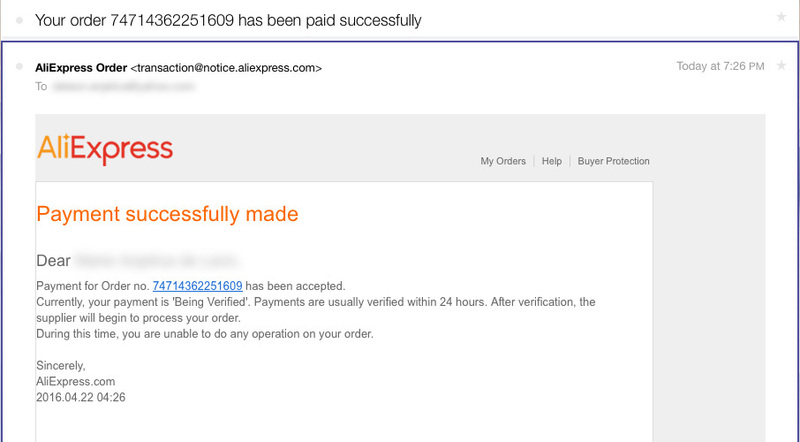 Do note that it would take 5-10 days before Aliexpress would flash the status of the order. Sometimes there is no status posted at all. 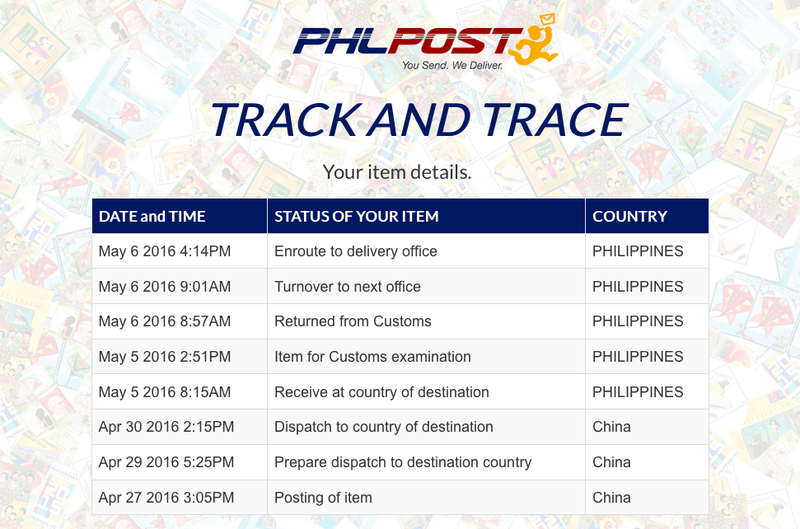 So what I'd like to do is check through Phlpost Track & Trace or Chinapost if you don't live in Philippines. Here's what you should see when you click the 'Track Order' button. 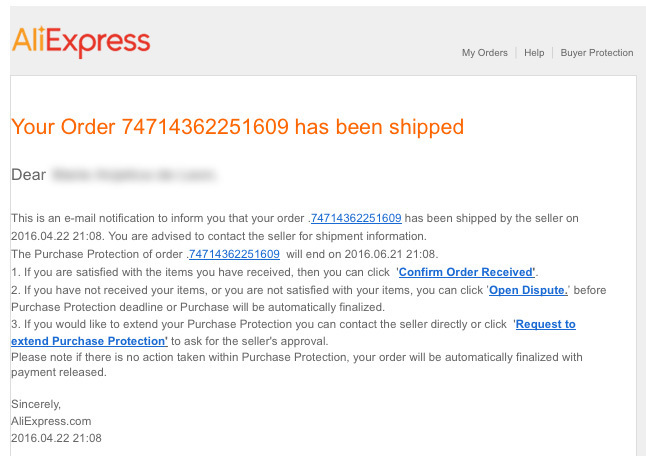 You can check the status from here if Aliexpress was able to post a tracking status of your order. Sometimes Aliexpress can't fetch your package status like I've said earlier.. You might be worried/wondering that you're package is lost.. 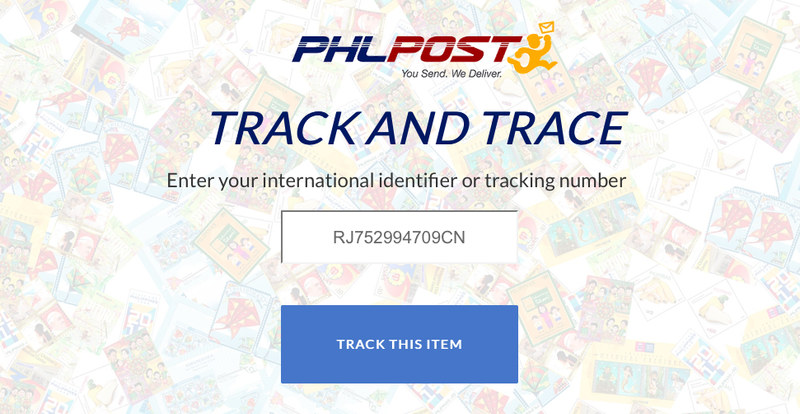 So better check Phlpost/Chinapost... Check my Phlpost Track and Trace screen grab below. The status you're waiting for is - Enroute to delivery office. This means your package is on it's way, either delivered to your doorstep or you'll get a notice to pick it up at the post office. On my experience, all my orders were delivered to our home, never have I picked up an item at the post office, i don't even know were it is so I'm lucky. My bf tried.. he had to pick up his first order, which was kinda small compared to some of most of my orders, at the post office. He lives in Las Pinas, fyi. 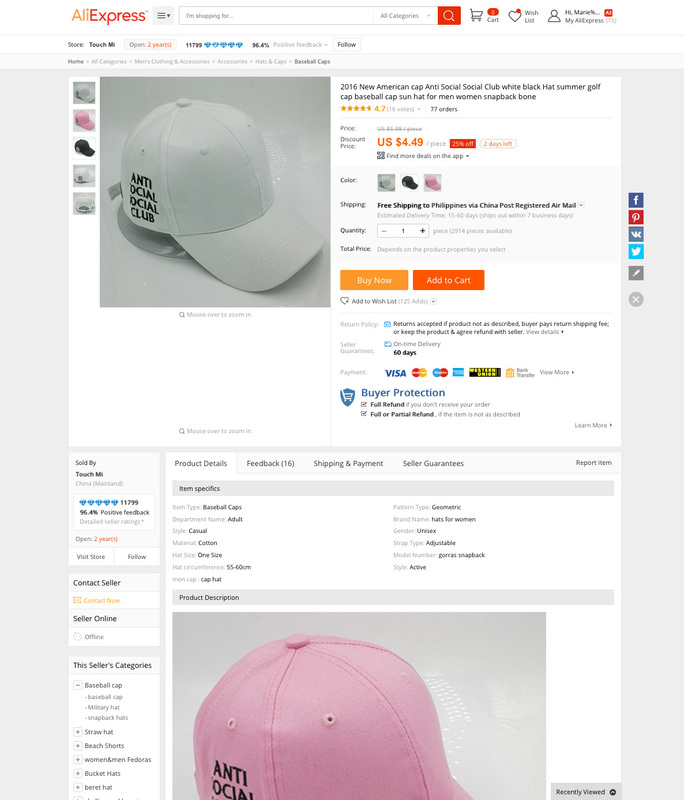 Here's the actual photo of the baseball caps ordered from Aliexpress. I bought one for me and one for my beau. Haha. 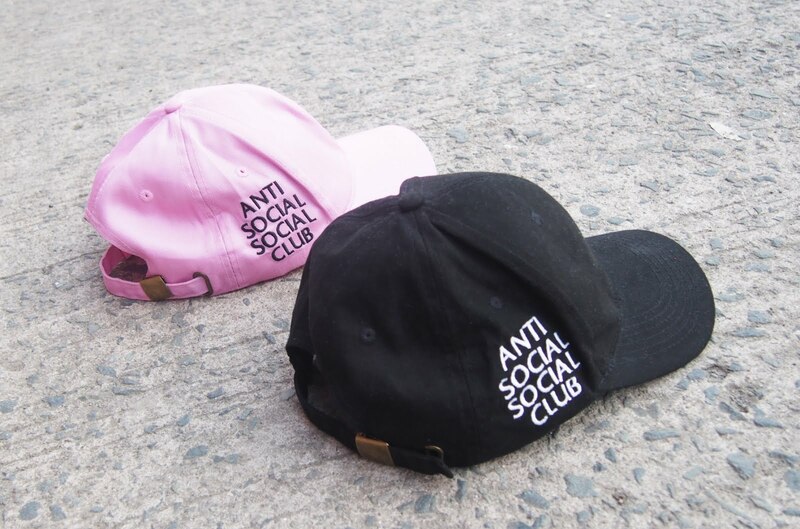 Since, we're both kinda shy we kinda belong to the ASSC club. That's basically how you buy products from Aliexpress. Now, I'd like to share a few tips, things I check whenever I'm shopping at Aliexpress. If there are no comments, but you really want to the product.. This happened to me... 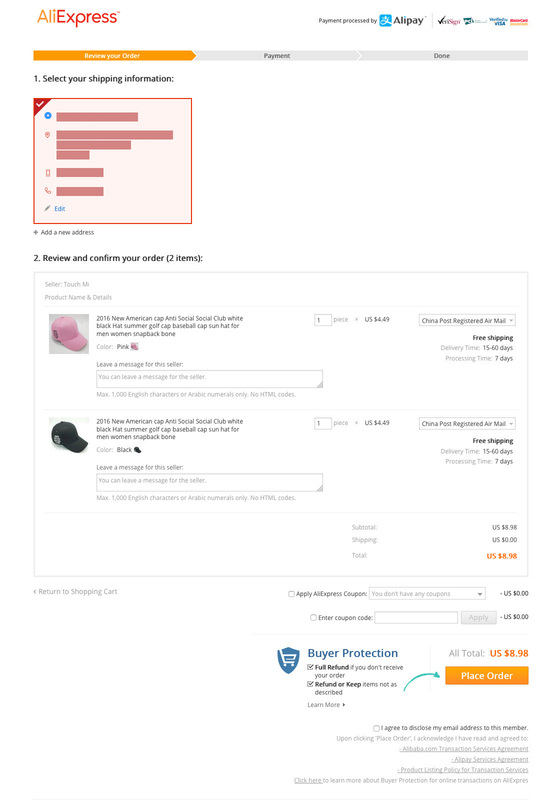 I ordered the product from the seller because I couldn't find other sellers selling the same product what I do is check out the seller rating and the overall store feedback - includes all comments of different items from the buyers. If the store is new usually they haven't accumulated enough comments so I put my faith forward and pray that the product is good enough. As mentioned above, always check the seller rating. Let's do this by comparing the stores below. Ganssia has earned a total of 6,288 sales (check with diamond icons/medal) and 99% feedback, while Bag Best had sold 538 with 98.5% feedback. Both are actually great values, I'd say these are 'Safe-to-Shop' stores. Most stores would actually have 90%+ of feedback. You'd think that's good but personally anything below 97% feedback is on the 'Not-So-Safe' to shop stores.. Anything below 95%, be careful... quality might not be as great as the picture. It's a bit tricky but just check the years they've been open (if there is), total sales and read feedbacks. Don't really think this would fall as tips but anyway one of the things I like with online shopping is the Wishlist function... Aliexpress has an enormous catalogue and once I find an item I might not be able to find it anymore. Plus, I like that you can categorize your list. Like what I have in mine.. Shorts, Shoes, Skirts, etc. I have to say the dispute/refund feature made me trust and shop at Aliexpress. There's this one time.. I ordered a wig but when I got it, it came in a bad quality. An area of the bangs were unevenly cut off.. It was tangled.. So I escalated a dispute.. and to cut the long story short, the seller was kind enough to give me an almost full-amount refund. I felt relieved... I had sent evidence photo of course.. You can check more about the Buyer Protection feature by clicking this link. 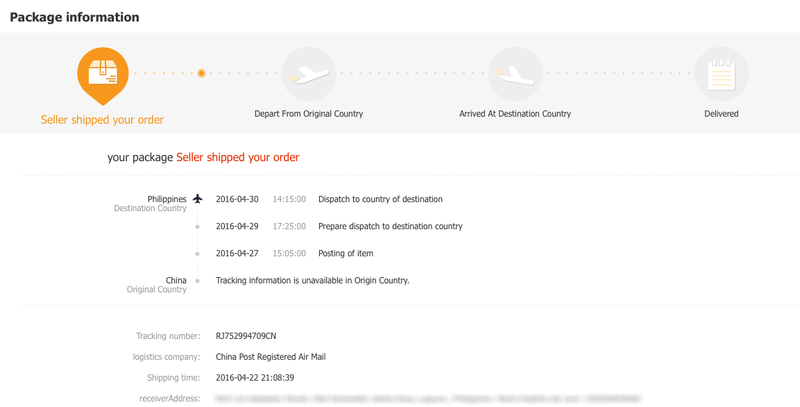 I've already mentioned above how you can track your post, via Aliexpress My Orders page, Phlpost & Chinapost. Most items sold in Aliexpress offer free shipping via China Post Registered Mail usually it would take approximately 20 days. It's actually faster now compared to my previous orders 2 years ago where it took 30+ days to arrive. If you want to get you're orders faster (3-10 days) you may opt to have the items shipped through EMS/DHL, quite pricey though. If you live in the Philippines and plan on buying gadgets I suggest you have it shipped thru DHL so you don't have to worry about customs as much. Know more about shipping and delivery, click here. I guess that's all I'd like to share for now. You can also read Aliexpress' New User Guide to help you through their site, which makes this post sort of pointless. There are many helpful guide/faqs on Aliexpress site actually, just head to the footer section. Haha... Feel free to comment/send me a message if you have questions I might be able to help you with. Happy Shopping... See you on the next! I'm not the girl with a perfect hair, a tall physique, nor am I someone who dresses up perfectly. I'm just a small town girl living in this lovely world and just trying to make it and find my place. This blog is where I keep an archive of my stuff -- personal style, eats, places and many other things my interest, dreams, etc. Hope you enjoy your stay in this online journal of mine. Save 15% on your purchase. Just type in the code 'ZBAP2ALO' upon check out.